This page features older news items from 2005 which have previously been featured on the main news page. Some of the information included here may well now be out-of-date. Thanks to Gene for the info about the interview. Field Day is out now. We've now added a page for Field Day to the discography and this includes the complete track listing for the album. Ant has agreed to sign all copies of Field Day that are pre-ordered from Camino Records. To quote from their site: "Please remember that as it will take time for Ant to do the signing there may be a short delay between the release date and the despatch of the pre-orders, but as usual we'll be a fast as we can!" Ant's new album is now completed and due for release in October. The album is called Field Day and is a double album of pieces based around acoustic stringed instruments in both solo and duet form. As well as the usual 6-string and 12-string guitar pieces, Ant has also composed new pieces for charanga, English bazouki and cittern. The album is being initially released as a limited edition digipack. Field Day can now be pre-ordered from Amazon. Just to clarify, the "limited edition" status that Amazon has given to the album refers to the digipack and not the album itself. Once the digipack has sold out then a regular pressing in a jewel case will replace it. ITV in the UK have scheduled some further repeats of Survival programmes and these included another of Nick Gordon's programmes for which Ant and Joji Hirota wrote and recorded the music. Gremlins: Faces In The Forest documents a three-year exploration of uncharted areas of the Amazon in search of marmoset monkeys and was first broadcast in 1998. Work also continues on putting the re-issues of The Geese & The Ghost, Wise After The Event and 1984 together. A number of potential items for inclusion as extra tracks have already been located and currently a large selection of further tapes for each album is being checked and transferred to digital formats. Updates on this can be found in our Projects section. The release date for the re-issues is under discussion at the moment and no potential date has been set for them yet. Over the last couple of weeks Ant has been working on mixing and editing the many tracks he has recorded for his new album and he aims to have this work completed soon. If all goes to plan then a release of the album in the Autumn still looks likely. ITV in the UK have repeated another of the Survival TV programmes for which Ant and Joji Hirota wrote and recorded the music. Jaguar: Eater of Souls sees film-maker Nick Gordon venturing deep into the Brazilian Amazon in a bid to track down the beautiful but solitary jaguar. The programme was first broadcast in 2001 and we believe that this repeat marks the first time that any of Nick's films have been shown on British television since his death last year. Jaguar: Eater of Souls was shown on ITV on Sunday 26th June at 11:45 am. For the first time in a while, ITV in the UK repeated one of the Survival TV programmes for which Ant wrote and recorded the music. The programme in question is Bears of the Russian Front, which looks at the experiences of an American scientist who has lived with giant Brown Bears in Russia for many years. It was first broadcast in 2001. Bears of the Russian Front was shown on ITV on 5th June at 11:05 am. Ant has now completed recording all the tracks he has written for the next album. The next stage will be editing the tracks - if all goes to plan then Ant hopes to release the album in the early autumn although this is subject to commitments to other projects. Ant has now completed work on his latest Library Music project for Atmosphere Music and amongst other things is looking forward to finishing off work on the long-awaited new album. A new re-issue of the first Genesis album From Genesis To Revelation has recently been released by Demon/Edsel. This "deluxe 2CD edition" includes the original album plus a second CD that includes various demos and rough mixes together with the A and B sides of the band's first two singles. The booklet also includes the sleeve note from the original release of the album, the lyrics to the album tracks and notes from music critic Chris Welch. For the collectors amongst you, there is nothing contained on the second bonus CD in this set that has not been released before. Most of the demos and rough mixes were originally released on the Genesis 4 CD box set Archive 1967-75 with the exception of the demo of The Image Blown Out, which has previously been released on an earlier re-issue of the album issued on the Disky label. 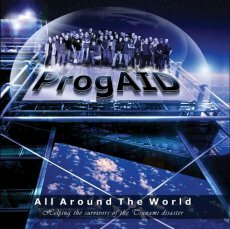 The ProgAID CD single release "All Around The World" is out now. It includes 4 different mixes of the track, along with an instrumental version and a "Making of..." video clip. The single costs �5 (including postage) and can now be ordered here. All proceeds from the CD single go to help the Asian Tsunami relief effort. Ant is one of many musicians who are contributing to the recording of "All Around The World", a charity CD single with all proceeds being donated to the Asian Tsunami Disaster Relief effort. The CD single is planned for release in mid-February. Further information can be found on the ProgAID site. Whilst Ant concentrates his efforts on the current Library Project, work has begun on compiling the re-issues of The Geese & The Ghost, Wise After The Event and 1984. Currently we are looking through all the available tapes for these albums with a view to establishing what additional material there is that may be suitable for inclusion as extra tracks. Updates on this work can be found in our Projects section. Ant currently remains busy working on a new Library Project for Atmosphere Music, with work on this set to continue until mid-April. As with the majority of his Library Projects, this will not be released commercially. As previously reported, Ant spent some time last summer recording many of the tracks he has written for the next album. However, work on his current Library Music project has meant that it has not yet been possible for recording to be completed and there is currently no news of any potential release date for the album.